All-Natural SmartFruit mixes deliver 100% fruit, with no added sugar. Every 16 oz. smoothie contains 3 servings of fruit, with no GMO’s, artificial colors, flavors, or additives. Each flavor is enhanced with a unique superfood powerhouse like omega-3, antioxidants, electrolytes, detoxifiers and other goodies. Smartfruit Harvest Greens is a groundbreaking “being healthy never tasted so good” kinda product! Detox your body with this 100% fruit and veggies blend. We’ve packed every bottle with dark green leafy powerhouses like Kale and Spinach. Then we coupled the greens with Apples, Kiwis, Pineapples, Bananas and Lemongrass for a vibrant interplay of dueling sweet and tart flavors. Lastly, we boosted this lovely medley with Spirulina, a superfood heavyweight which acts as a powerful detoxifier rich in chlorophyll, protein, vitamins and fatty acids. 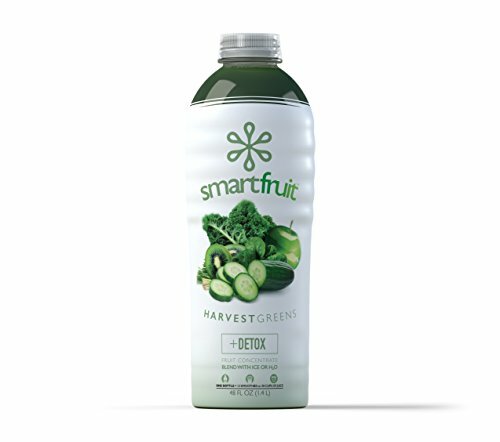 Add H2O or ice to harness the harvest of Smartfruit Harvest Greens in a refreshing all natural juice or smoothie.